Strong arms are really great to have. They don’t only look appealing in tank tops but they also allow you to do all kinds of stuff including lifting. There are many benefits to having muscle including in your arms so let’s get down to the ways of obtaining those amazing strong arms. Shoulders consist of three types of fibers. There are exercises that target the shoulder differently depending on what part of the shoulder acts as a primary Try a seated dumbbell fly to help keep your shoulders in a neutral position and work the middle delts. A bent-over seated fly will work your rear delts. Front raise or overhead press can be used to work the front delts. 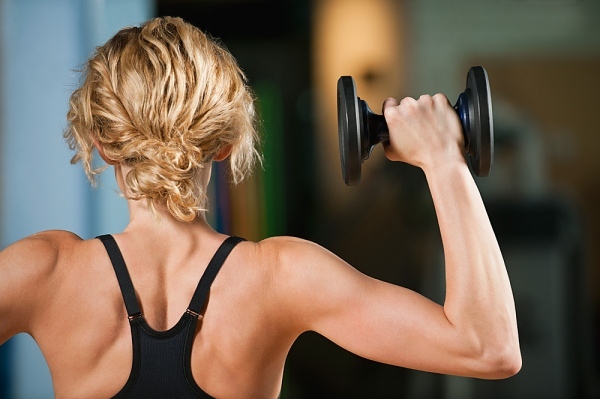 Biceps are the muscles in the upper forearm. These, when trained make the arms looks slimmer but also much shapely at the same time. Bicep and hammer curls are classic exercises but they have many different variations that can help you get strong round biceps. Finally, the muscles that are often suggested for training to eliminate bat wings, triceps are located at the back of your upper arms. These help you to straighten the arm. They also can be trained in a number of ways one of which is pulley tricep extension and another is a tricep press. These are all great exercises to get into your workout routine and switch from one to another from three to six weeks. Push ups and pull ups are also great for training arms but to perform them you probably have to build up some upper body strength beforehand. This entry was posted in Workouts and tagged arms, strength training. Bookmark the permalink.